Time to adjust…AHEM…Personal time. I tend to cook when I get stressed when, when I’m feeling down or when I just plain damn want to. This post is dedicated to that time-that personal time for needed for rejuvination. 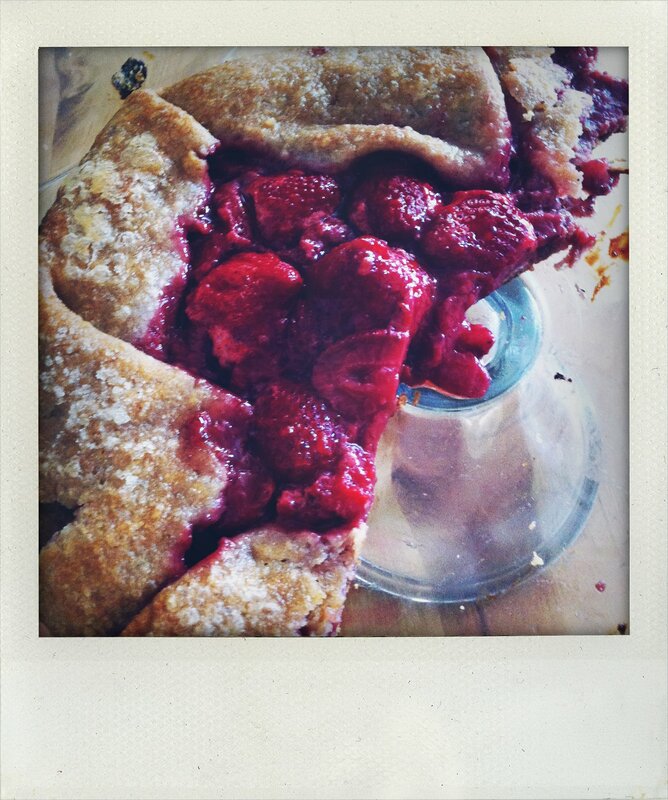 I was inspired to make this galette when on a photo shoot there was an excess of rhubarb. 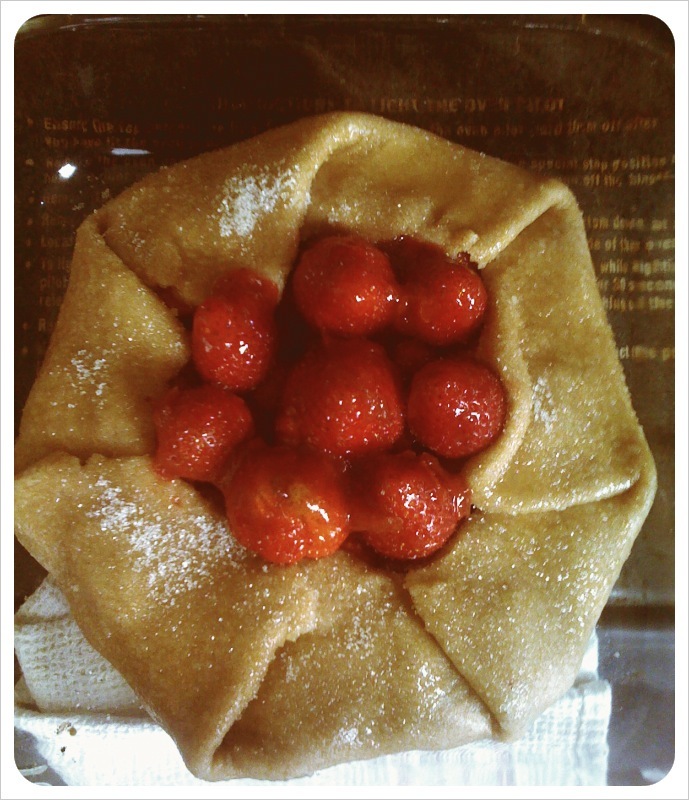 Some garden strawberries were ripe and picked and my first galette was made! I love Galettes! This recipe is adapted from the SmittenKitchen files for a Nectarine Galette, and for further reference another post of theirs for hand pies and other free form tarts here: pate brisee, galette and hand pies. From there I was inspired to look up more recipes – all links will be posted below. This lovely snack, dessert and all around heart warming free form tart is beautiful and easy to make. I adjusted their recipe and added 1/2 a cup of blanched almond meal to the dough. The almond meal adds a nice nuttiness and toothsomeness (is that a word?). Made with lots of love , I also made my strawberry and rhubarb jam. The strawberries used were the most beautiful and sweet strawberries found at the Marin Farmers Market. David Lebovitz of Chez Panisse and Cookbook fame writes here about Galettes. 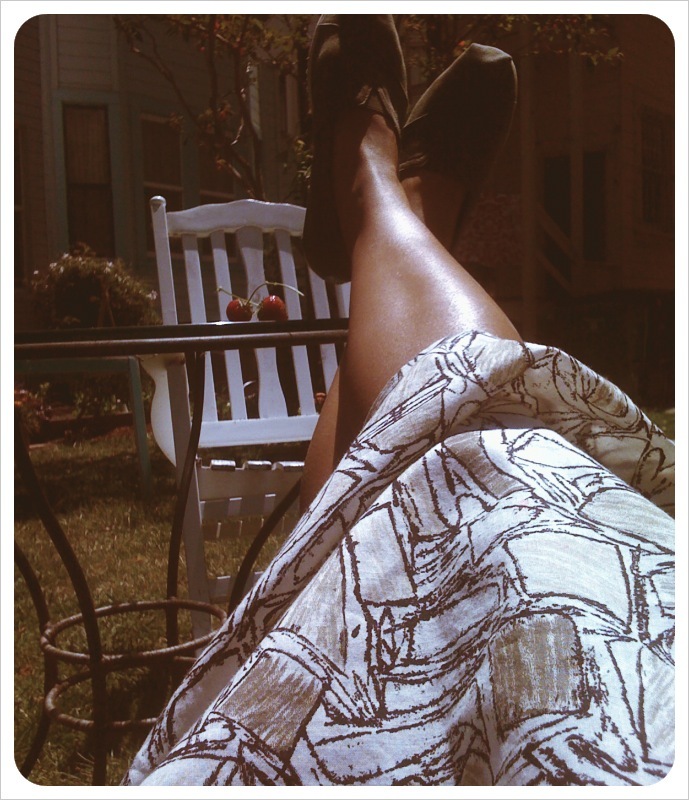 on Fine Living. He uses cookie crumbles on the bottom of the tart before the fruit, while the JoyofBaking site they used frangipane, and on SmittenKitchen they used a almond, flour and sugar mixture. All seem to be a sponge for the fruit as they seep out their juices. Mine turned out extra juicy, so I may employ that tip next time around. A Pate Brisee is a short form pastry dough which is really easy to make. There are also a few explanations of it including one here for further explanation of a galette on JoyofBaking.com as well as a beautifull recipe for a simple Pate Brisee (dough) and Cranberry Galette. Place milk, water and ice into bowl set aside. Place flour, almond meal, sugar, and salt into bowl and whisk to incorporate. Cut very cold butter into medium-sized cubes. David Lebovitz puts it best when he calls it “Sugar cube size”. Place into bowl. Using a pastry cutter work butter and flour together till crumbled pieces form. Crumbles should resemble a topping for cobblers or oat size. Work quickly, do not let butter get too soft. Add your liquid mixture tablespoon by tablespoon till mixture is able to form a uniform ball, when lightly packed by hand-divide into two sets of dough. Wrap in plastic. Place in refrigerator for 1-2 hours- this step is very important-cold butter will aid in the process of rolling out the dough to yield a flaky crust. Using the roll and fold over method, I noticed that it really did help to form a flakier and overall more enjoyable crust and foundation for my tart. Scant 2 Cups Fresh Strawberries. Place Jam onto your rolled out tart dough and evenly coat. Be sure to leave about 1.5 to 2 inches of space for the crust. Sprinkle remaining almond meal onto jam. Place strawberries onto tart to form a beautiful circular labyrinth of fruit filling (I like to halve the strawberries and leave a couple of whole ones upside down for the centerpiece.) Sprinkle filling with 1 T of Sugar. Using a pleating method fold Tart crust over (see picture above for reference.) The genius with this dessert is that you do not have to be perfect with your pleating. Brush egg wash onto crust and sprinkle generously with course raw sugar. Bake for 40 minutes, till you get a lovely golden brown bottom. At this point be careful because the juices will be oozing out of the tart. Zest lemon and orange set aside. Place strawberries into pan, cover with sugar and juices. Cook for 10-15 minutes till juices have seeped out. Remove strawberries and place in separate bowl. Add zest of orange and lemon, as well as balsamic. Reduce. Taste for sweetness and adjust accordingly. After liquid has reduced by 1/2 half add your strawberries to the last 5 minutes of cooking. Total cooking time 25 minutes. This is a very easy jam and has a robust and fruity strawberry flavor. ESPECIALLY when they are ripe and red with the season. The citrus also really sparks this jam with loads of brightness. The step to take the fruit out earlier in the cooking process promises a preserve whose flavors, textures as well as color remain hearty, bright and vibrant. Take notice next time you are out trying jams and jellies, how some strawberry preserves tend to taste and look darker and deeper all while losing their fresh strawberry charm. I learned this technique from a a very special and talented former Zuni Pastry Chef named Jennifer Grantham. LINKS: For fun and reference. play around with all the different ways and different fillings that all these recipes and tips have to offer.